The way I read the flyer it appears Slant 6 is $30 per day with races on Saturday and Sunday. The new track manager at Mountain Park Dragway is Scott Richardson. I talked to his wife back in July. I will keep trying to contact him. Here is the Clay City flyer. Scotty said we could run the Knoxville make up race Saturday. I'll call him again tomorrow to verify if we can run it as 1/8 mile. Wow, that all looks very cool. Thanks for working with Scott and clarifying everything. Hope the turnout is good. I am really looking forward to it! 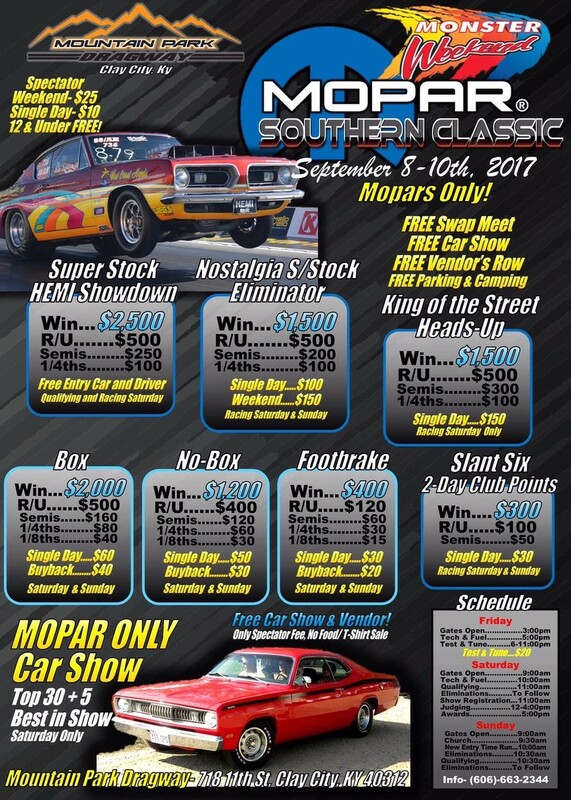 Please post here if you plan to attend the Clay City race 9-10 September. Test & Tune is Friday evening. Rumor has it (or perhaps I've exchanged a PM or two... ) that Team Green is looking forward to taking a couple more records at this event. We will be running the Knoxville make up race Saturday as 1/8 mile along with the regular two races as 1/4 mile. That gives plenty of opportunity for record setting. There is information about lodging on the Mountain Park website at mpdragway.com. . In years past I think some stayed at Abner's motel just about 5-10 minutes from the track.